I found it only appropriate that I should share an ooey gooey melty cheese recipe while I’m travelling in Switzerland, a.k.a. the Melted Cheese Capital of the World (<- don’t quote me on that 😉 ). 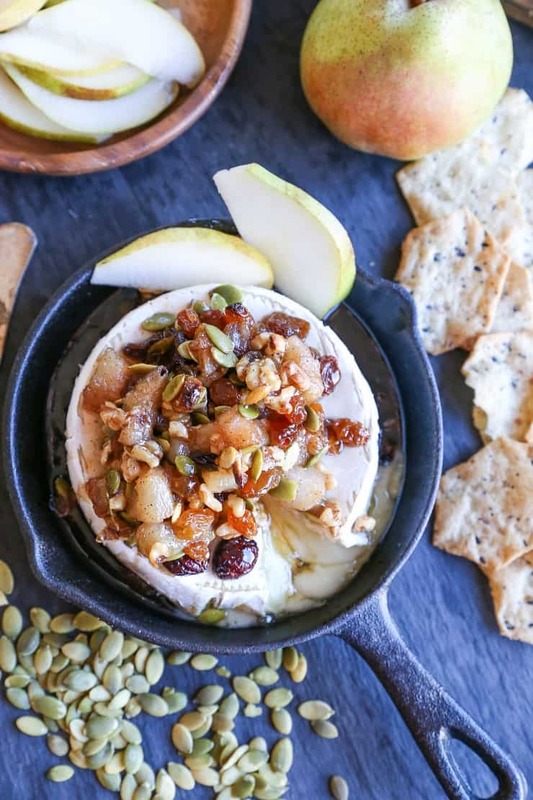 In all seriousness, this baked brie with maple-spiced pears and walnuts is the way to go when you’re entertaining guests for any gathering this fall and winter. It’s particularly useful when you’re in a bind and need to whip out a shmancy, yet cost effective and SUPER QUICK appetizer because you’re like me and your procrastinate all the things in life. Football appys? Here’s your crowd-pleasing, pantry pirate-appeasing appetizer to hand over to your hangry friends on game day. Yeeer welcome. 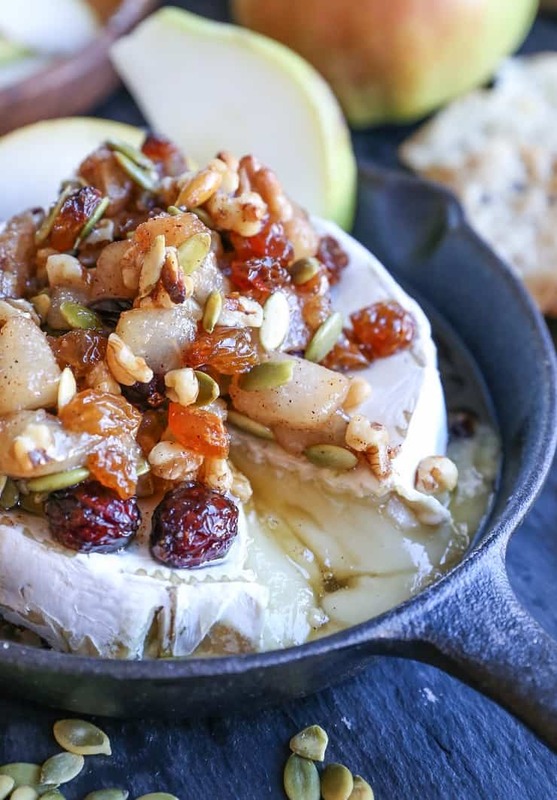 And if you’re looking to be a real badass, you can bring this baked brie into your Fall Harvest Meat & Cheese Board to really spice up your life! While I don’t consume much dairy, I do know that not many people can resist the temptation of a nice melty cheese. Add spiced fruit and nuts to the mix, and fo’gedaboutit, you’ve got yourself a captive audience. So basically, I’m doing this for your own good. If not to benefit yourself, to share with your friends and family during football and holiday season. For those of you who, like me, have trouble digesting cow dairy, I see you…I feel you…I’ve got you. I typically go with goat or sheep’s milk brie because they are much more tolerable for my GI tract. Just know there are options when it comes to the milk. The man doesn’t typically get very animated about food, but I actually got a reaction out of him with this baked brie. He did a little knee-wobble dance, got all bright-eyed and bushy-tailed and legit said the words, “Too much flavor! Maaaaagh there’s too much flavor!” Translation: he liked the baked brie mucho. 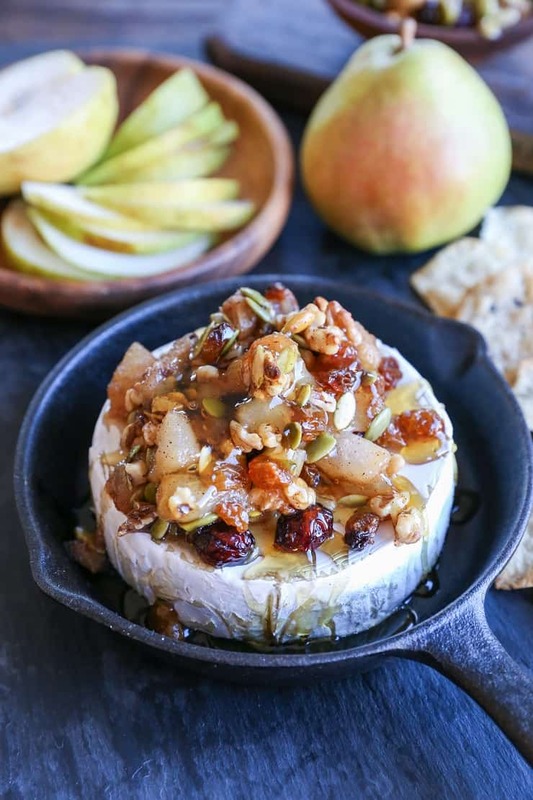 I confessed this in my Baked Brie with Boozy Fig-Candied Pecans and Baked Brie with Maple Spiced Apples posts, but my favorite way to consume brie cheese is baked with some sweet & savory fruit and nut concoction on top. 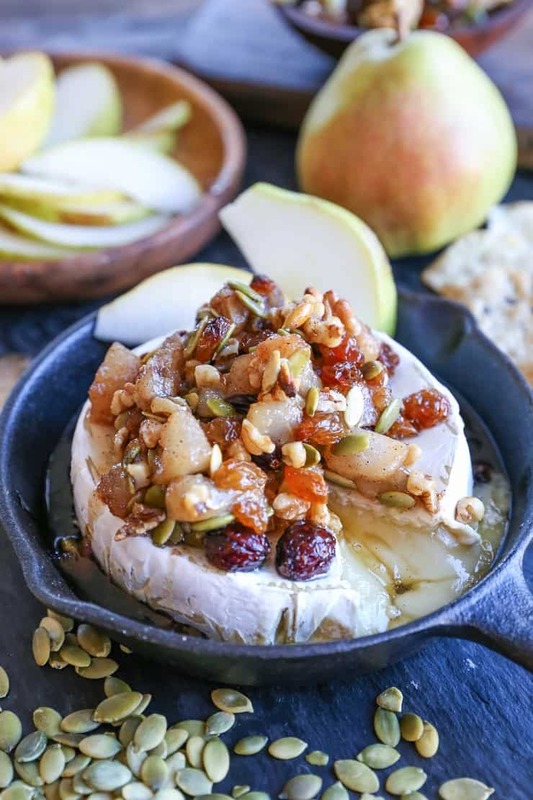 This spiced pear compote takes less than 10 minutes to make and in my opinion, it takes brie from aiight to next level with the touch of a button (as in the “Bake” button on your oven). From start-to-finish, this baked brie takes no longer than 30 minutes to make, and that’s being generous, allowing you to get distracted on Instagram whilst preparing. Let’s talk dippers. For many folks, you can’t go wrong with sliced toasted baguette. Always a great option! I love using gluten-free crackers so that the experience doesn’t turn into a carb load, and also love using sliced pears and apples for dipping. If you want to get really funky with this, you can come up with all sorts of flavor concoctions atop your toasted baguette, and even invite prosciutto, bacon, or pancetta to the scene. Add everything but the brie cheese to a small skillet and heat to medium-high. Cook, stirring occasionally, until mixture has thickened, pears have softened, and everything appears sticky, about 5 to 8 minutes. 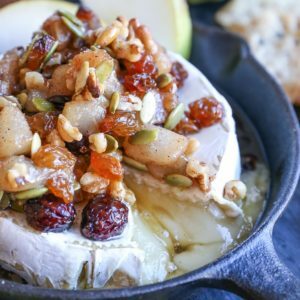 Unwrap the brie cheese and place it in an oven-safe dish (preferably the dish you'll be using for serving). Top with the pear-walnut mixture and bake on the center rack of the oven for 15 to 20 minutes. Serve with choice of gluten-free crackers, sliced pears or apples, and/or toasted baguette.